deepsouthsports.net: Worst. Spring Game. Ever. 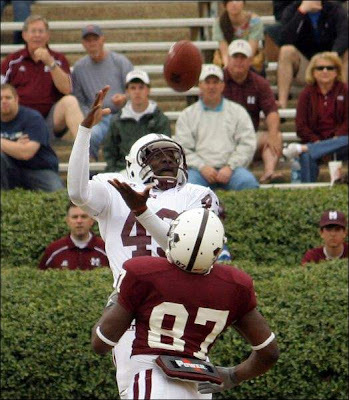 It looks like the Mississippi State spring game got Croomed. After 48 minutes of play, the meager "crowd" of 5,000 rednecks in attendance were treated to a barn burning 0-0 in the Stark-bowl. That's right, Croom's spring game actually had to go to overtime to get the win against its self. Somehow, I wouldn't expect any less from this crackerjack group of a-holes. About a half-hour later, out strolled McCorvey (State's 5th year O.C. who was crying for the first 25 minutes), who stressed that the offense's lackluster Saturday performance shouldn't overshadow strides he claims have been made in the five weeks prior. "We made a lot of progress," McCorvey said. "It's not evident out there today because we had some quarterback-center exchanges and had the interceptions and all, but overall this spring I felt like we made a lot of progress. We came a long way." Riiight. "Showing progress is not what we're about here at Mississippi State...Fan support, offensive production and earning one's pay checks...these are not things that concern us." I just had to translate that for you. How the hell this douche nozzle McCorvey has maintained a coordinator job in the SEC for 5 effin years without even one...one mediocre season of offensive output is...well mindbottling. Of course, State folk would say, "That just means our defense is kickass, man." No. Your defense may be your saving grace again this season (despite the loss of several key cogs), but if your scrote lickin' offense can't even so much as put up a field goal in 48 minutes of the "Don't hit my no-talent quarterback!" spring scrimmage, it's gonna be a looong freakin' year. Oh yeah...As much as crappy offense and pathetic, effeminate quarterbacks are a staple at MSU, Starkganistan's biggest tradition has always been felonious thuggery. As a continuance of Croom's recruits and their stellar record of cop beatdowns and signing scholarships from jail, this thuggish-ruggish episode involves alleged on campus handguns and drive-bys! 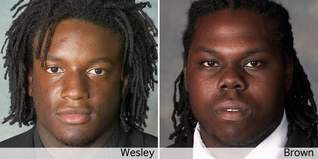 A Thursday night shooting incident at Zacharias Village, a group of four relatively new dormitories on the campus' north side, left senior left tackle Mike Brown, the anchor of the team's offensive line, dismissed from school and the team. Same for Quinton Wesley, who was expected to compete for a starting job at defensive tackle. Brown, 21, is charged with possession of a firearm on school property, a felony. Wesley, 21, is charged with aggravated assault after he allegedly fired on another vehicle at the dormitory. MSU police chief Georgia Lindley said the investigation continues and that it's possible more charges will result. Erik, I hope you weren't actually in attendance. Sounds like this one set football back a good many years. Didn't know there was so much trouble to get into in Starknakedville. Are they recruiting in Alabama again? because I am too damn lazy to check out any State related press, do you know how Dixon did in State's Spring Game?